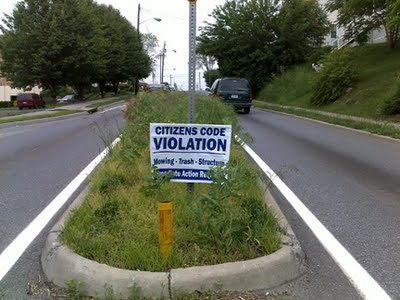 It appears that the Citizens Code Violation Committee is back in force and this year they appear to be fully funded. This committee consists of a group of concerned citizens and was formed in 2010. But as you may remember, in 2010 they were hand writing signs. It appears that they now have professionally printed signs. The CCV blanketed the city today with code violations. Over 100 violations were found. The city apparently has decided to stop mowing their property and at the same time ramp up their mowing violations on the hard working people of Roanoke. The city says that they haven't allocated money in their budget to cut their property on a regular basis. It appears that their priorities have been positioned elsewhere. I wonder if the citizens could use that excuse as well. I've got news for you. Times are tight for everyone these days. At least the city is still maintaining all of the property tax they had since the bubble popped. Property values in Roanoke have dropped by 20% but the tax appraised values haven't dropped accordingly as they should have. 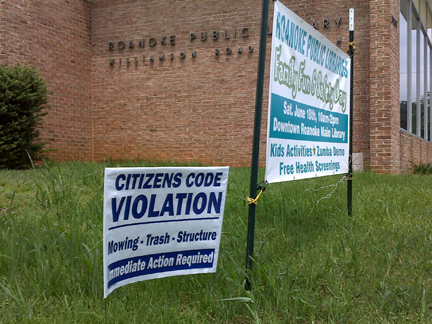 The do as I say but not as I do philosophy is not something that the citizens of Roanoke agree with. The city should be leading by example. They should set the same standards to their own property as they demand from others. As you know, the fines for mowing your grass or criminal charges given to you by code enforcement for not maintaining your property are quite substantial. Here's a photo from SE Roanoke. The City property mowing violations were the worst in this area. It appears that the city feels that SE Roanoke is the armpit of the city and they don't have to spend an equal amount of time there as they do in other areas. No, Those Aren't Planted Areas. That is ALL grass and weeds. The city hasn't cut any of this SE median property even a single time this year. The CCV says Immediate Action is Required. I would have to agree. 25 years ago the city had a staff of 4 people in the code enforcement office. The population was significantly larger at that time. Today the code enforcement department has a staff of 19. And from what I understand they are up to a quarter of a million dollars in fines each year and planning on more for this year. Plus as usual the city allocated more money to the department in the upcoming yearly budget. Maybe they can squeeze in a few more code enforcers. I wonder why it was that 25 years ago the code enforcement staff was able to manage such a larger population of people and property and today it takes 19 to do the same job. Too much red tape these days? A desire to continually increase the size of government? A power grab to control the people? I don't know. All I know is I will have to take my hat off to those 4 people back in the day because they were clearly efficient hard working individuals. We all agree that keeping your property in good condition is a good thing for Roanoke. The city not maintaining its own property while demanding that others do is unethical. They are also lowering the value of surrounding houses near their unmaintained property. And when the neighborhood groups have asked if they can maintain areas such as the medians through SE Roanoke the city firmly said no stating that it was too dangerous due to the traffic. Lets hope that the city does the right thing and cuts their grass no later than Monday. Thanks to the CCV for spending their hard earned money to make a light hearted message to the city that one should lead by example. On my way home from dinner tonight, my son in law comments about the sign on the side of the road. He said "This grass is ridiculous, I'm glad they received a "citizen code violation". I could never get away with letting my grass get that high." He is so right...the grass on the side of Hershberger/Plantaion area is at least 20 inches tall, if not more. The new fire dept has mowed their area and then next to it looks like a trash dump. If they paid the contractors to mow those areas like they pay them to mow the yards that they write up, it would be money better spent.